The unique LARSSON™ hydrocyclone concept enables inspection or cleaning without any special tools. This significantly reduces the standstill time for cleaning and inspection. When the housings are opened, the vortexes and cyclones are automatically separated, ready for quick inspection. This ingenious, patented concept from LARSSON is based on the application of hydraulic force to the housing, evenly applied over each entire housing to press the vortexes and cyclones together. In LARSSON™ hydrocyclones housings, the product is always in motion. LARSSON dimensions the channels to allow the speed of the flow to produce a selfcleaning effect in the channels. The result is minimal bacteria growth. 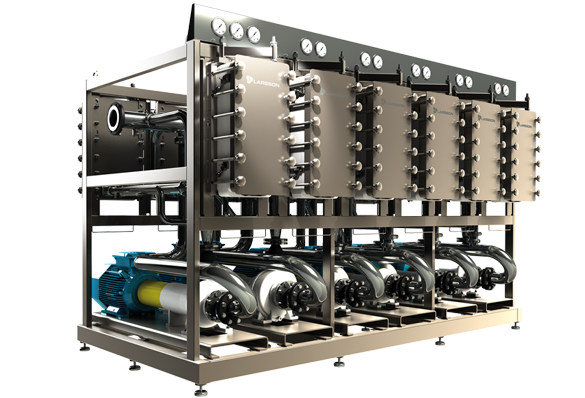 LARSSON offers a flexible system that can be adapted to both large and small flow requirements. Together with highly developed LARSSON process engineering and automatic control technology, the LARSSON™ hydrocyclones are well known for superior starch quality. LARSSON™ hydrocyclone multi cyclone housing 520/10 is developed to meet higher capacities. Inspection of the cyclones has been reduced to a minimum of 3 minutes due to a unique concept developed by LARSSON.